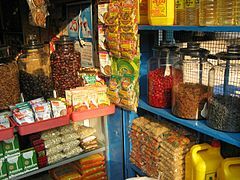 The spice trade developed throughout the Indian subcontinent and Middle East by at earliest 2000 BCE with cinnamon and black pepper, and in East Asia with herbs and pepper. The Egyptians used herbs for mummification and their demand for exotic spices and herbs helped stimulate world trade. The word spice comes from the Old French word espice, which became epice, and which came from the Latin root spec, the noun referring to “appearance, sort, kind”: species has the same root. By 1000 BCE, medical systems based upon herbs could be found in China, Korea, and India. Early uses were connected with magic, medicine, religion, tradition, and preservation. Cloves were used in Mesopotamia by 1700 BCE. [note 1] The ancient Indian epic Ramayana mentions cloves. The Romans had cloves in the 1st century CE, as Pliny the Elder wrote about them. 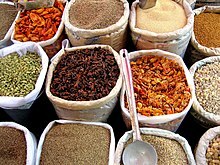 The earliest written records of spices come from ancient Egyptian, Chinese, and Indian cultures. The Ebers Papyrus from Early Egyptians that dates from 1550 B.C.E. describes some eight hundred different medicinal remedies and numerous medicinal procedures. In the story of Genesis, Joseph was sold into slavery by his brothers to spice merchants. In the biblical poem Song of Solomon, the male speaker compares his beloved to many forms of spices. “The Mullus” harvesting pepper. Illustration from a French edition of The Travels of Marco Polo. Spices were among the most demanded and expensive products available in Europe in the Middle Ages, the most common being black pepper, cinnamon (and the cheaper alternative cassia), cumin, nutmeg, ginger and cloves. Given medieval medicine‘s main theory of humorism, spices and herbs were indispensable to balance “humors” in food, a daily basis for good health at a time of recurrent pandemics. In addition to being desired by those using medieval medicine, the European elite also craved spices in the Middle Ages. An example of the European aristocracy’s demand for spice comes from the King of Aragon, who invested substantial resources into bringing back spices to Spain in the 12th century. He was specifically looking for spices to put in wine, and was not alone among European monarchs at the time to have such a desire for spice. Spices were all imported from plantations in Asia and Africa, which made them expensive. From the 8th until the 15th century, the Republic of Venice had the monopoly on spice trade with the Middle East, and along with it the neighboring Italian maritime republics and city-states. The trade made the region rich. It has been estimated that around 1,000 tons of pepper and 1,000 tons of the other common spices were imported into Western Europe each year during the Late Middle Ages. The value of these goods was the equivalent of a yearly supply of grain for 1.5 million people. The most exclusive was saffron, used as much for its vivid yellow-red color as for its flavor. Spices that have now fallen into obscurity in European cuisine include grains of paradise, a relative of cardamom which mostly replaced pepper in late medieval north French cooking, long pepper, mace, spikenard, galangal and cubeb. Spain and Portugal were interested in seeking new routes to trade in spices and other valuable products from Asia. The control of trade routes and the spice-producing regions were the main reasons that Portuguese navigator Vasco da Gama sailed to India in 1499. When Gama discovered the pepper market in India, he was able to secure peppers for a much cheaper price than the ones demanded by Venice. At around the same time, Christopher Columbus returned from the New World. He described to investors new spices available there. The military prowess of Afonso de Albuquerque (1453–1515) allowed the Portuguese to take control of the sea routes to India. In 1506, he took the island of Socotra in the mouth of the Red Sea and, in 1507, Ormuz in the Persian Gulf. Since becoming the viceroy of the Indies, he took Goa in India in 1510, and Malacca on the Malay peninsula in 1511. The Portuguese could now trade directly with Siam, China, and the Maluku Islands. One issue with spices today is dilution, where spices are blended to make inferior quality powdered spices, by including roots, skins and other admixture in production of spice powder. A typical home’s kitchen shelf of spices in the United States or Canada. A spice may be available in several forms: fresh, whole dried, or pre-ground dried. Generally, spices are dried. Spices may be ground into a powder for convenience. A whole dried spice has the longest shelf life, so it can be purchased and stored in larger amounts, making it cheaper on a per-serving basis. A fresh spice, such as ginger, is usually more flavorful than its dried form, but fresh spices are more expensive and have a much shorter shelf life. 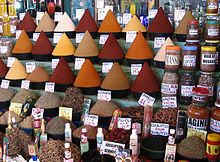 Some spices are not always available either fresh or whole, for example turmeric, and often must be purchased in ground form. Small seeds, such as fennel and mustard seeds, are often used both whole and in powder form. To grind a whole spice, the classic tool is mortar and pestle. Less labor-intensive tools are more common now: a microplane or fine grater can be used to grind small amounts; a coffee grinder[note 2] is useful for larger amounts. A frequently used spice such as black pepper may merit storage in its own hand grinder or mill. Some flavor elements in spices are soluble in water; many are soluble in oil or fat. As a general rule, the flavors from a spice take time to infuse into the food so spices are added early in preparation. This contrasts to herbs which are usually added late in preparation. A study by the Food and Drug Administration of shipments of spices to the United States during fiscal years 2007-2009 showed about 7% of the shipments were contaminated by Salmonella bacteria, some of it antibiotic-resistant. As most spices are cooked before being served salmonella contamination often has no effect, but some spices, particularly pepper, are often eaten raw and present at table for convenient use. Shipments from Mexico and India, a major producer, were the most frequently contaminated. However, with newly developed radiation sterilization methods, the risk of Salmonella contamination is now lower. Because they tend to have strong flavors and are used in small quantities, spices tend to add few calories to food, even though many spices, especially those made from seeds, contain high portions of fat, protein, and carbohydrate by weight. However, when used in larger quantity, spices can also contribute a substantial amount of minerals and other micronutrients, including iron, magnesium, calcium, and many others, to the diet. For example, a teaspoon of paprika contains about 1133 IU of Vitamin A, which is over 20% of the recommended daily allowance specified by the US FDA. The Indian Institute of Spices Research in Kozhikode, Kerala, is devoted exclusively to conducting research for ten spice crops: black pepper, cardamom, cinnamon, clove, garcinia, ginger, nutmeg, paprika, turmeric, and vanilla. Night spice shop in Casablanca, Morocco. ^ A team of archaeologists led by Giorgio Buccellati excavating the ruins of a burned-down house at the site of Terqa, in modern-day Syria, found a ceramic pot containing a handful of cloves. The house had burned down around 1720 BC and this was the first evidence of cloves being used in the west before Roman times. ^ Other types of coffee grinders, such as a burr mill, can grind spices just as well as coffee beans. ^ Nutmeg, in particular, suffers from grinding and the flavor will degrade noticeably in a matter of days. ^ Light contributes to oxidation processes. ^ Thomas, Frédéric; Daoust, Simon P.; Raymond, Michel (2012). “Can we understand modern humans without considering pathogens?”. Evolutionary Applications. 5 (4): 368–379. doi:10.1111/j.1752-4571.2011.00231.x. ISSN 1752-4571. PMC 3353360. PMID 25568057. ^ Steven E. Sidebotham (May 7, 2019). Berenike and the Ancient Maritime Spice Route. Univ of California Press. ISBN 978-0-520-30338-6. ^ a b Murdock, Linda (2001). A Busy Cook’s Guide to Spices: How to Introduce New Flavors to Everyday Meals. Bellwether Books. p. 14. ISBN 978-0-9704285-0-9. ^ O’Connell, John (2016). The Book of Spice: From Anise to Zedoary. Pegasus Books. ISBN 978-1-68177-152-6. ^ Duke, J.A. (2002). CRC Handbook of Medicinal Spices. CRC Press. p. 7. ISBN 978-1-4200-4048-7. Retrieved May 9, 2017. ^ Woodward, Penny (2003). “Herbs and Spices”. In Katz (ed.). Encyclopedia of Food and Culture. 2. Charles Scribner’s Sons. pp. 187–195 – via Gale Virtual Reference Library. ^ Burkill, I.H. (1966). A Dictionary of the Economic Products of the Malay Peninsula. Kuala Lumpur: Ministry of Agriculture and Co-Operatives. ^ a b Freedman, Paul (June 5, 2015). “Health, wellness and the allure of spices in the Middle Ages”. Journal of Ethnopharmacology. Potent Substances: On the Boundaries of Food and Medicine. 167: 47–53. doi:10.1016/j.jep.2014.10.065. PMID 25450779. ^ Adamson, Melitta Weiss (2004). Food in Medieval Times. Westport, Conn: Greenwood Press. p. 65. ISBN 978-0-313-32147-4. ^ “The Dark Truth Behind Powdered Spices: Garlic”. Regency Spices for China Business Limited. September 3, 2014. ^ a b Host: Alton Brown (January 14, 2004). “Spice Capades“. Good Eats. Season 7. Episode 14. Food Network. ^ Gardiner Harris (August 27, 2013). “Salmonella in Spices Prompts Changes in Farming”. The New York Times. Retrieved August 28, 2013. ^ Ninfali, Paolino; Mea, Gloria; Giorgini, Samantha; Rocchi, Marco; Bacchiocca, Mara (2007). “Antioxidant capacity of vegetables, spices and dressings relevant to nutrition”. British Journal of Nutrition. 93 (2): 257–66. doi:10.1079/BJN20041327. ISSN 0007-1145. PMID 15788119. ^ “Production of Spice by countries”. UN Food & Agriculture Organization. 2011. Archived from the original on July 13, 2011. Retrieved December 20, 2013. ^ “67.220: Spices and condiments. Food additives”. International Organization for Standardization. 2009. Retrieved April 23, 2009. Dalby, Andrew (2000). Dangerous Tastes: The Story of Spices. University of California Press. ISBN 978-0-520-23674-5. Freedman, Paul (2008). Out of the East: Spices and the Medieval Imagination. Yale University Press. ISBN 978-0-300-21131-3. Keay, John (2006). The Spice Route: A History. John Murray. ISBN 978-0-7195-6199-3. Krondl, Michael (2008). The Taste of Conquest: The Rise and Fall of the Three Great Cities of Spice. Random House. ISBN 978-0-345-50982-6. Miller, James Innes (1969). The spice trade of the Roman Empire, 29 B.C. to A.D. 641. Oxford: Clarendon P. ISBN 978-0-19-814264-5. Morton, Timothy (2006). The Poetics of Spice: Romantic Consumerism and the Exotic. Cambridge University Press. ISBN 978-0-521-02666-6. Turner, Jack (2004). Spice: The History of a Temptation. Knopf. ISBN 978-0-375-40721-5. Sallam, Kh.I. ; Ishioroshi, M; Samejimab, K. (December 2004). “Antioxidant and antimicrobial effects of garlic in chicken sausage”. Lebensm. Wiss. Technol. 37 (8): 849–855. doi:10.1016/j.lwt.2004.04.001. PMC 1805705. PMID 17330154. Billing, Jennifer; Sherman, Paul W. (March 1998). 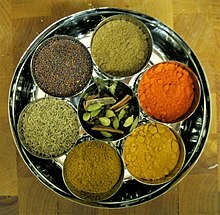 “Antimicrobial Functions of Spices: Why Some Like it Hot”. The Quarterly Review of Biology. 73 (1): 3–49. doi:10.1086/420058. PMID 9586227. “Spice”. Encyclopedia of Spices, Spice Blends by Region, The Spice Trade. Retrieved December 20, 2008.
International Organization for Standardization (2009). “67.220: Spices and condiments. Food additives”. Retrieved April 23, 2009.